The Queensland paper, the Chronicle, has reported today that a local woman withdrew the stolen $20 notes from a bank in Toowomba - a town 127 kilomtres west of Brisbane! TOOWOOMBA resident Jamila Verdouw was expecting to spend her Fiji vacation relaxing on the beach, not explaining to police how money stolen in a recent million-dollar heist ended up in her pocket. The truth was, she had no idea how it got there either. Miss Verdouw's heart skipped a beat when she arrived at the airport in Fiji only to be told the 10 $20 Fijian notes she withdrew from a Toowoomba bank were the same ones stolen in a recent $1 million robbery ($A556,000). “I was just like ‘oh my God, what is going on? ',” Miss Verdouw said. “Customs scanned the serial number of all my $20 Fijian notes then started talking into their walkie talkies in Fijian. “Police then came and told me I was carrying stolen money and I had to follow them into a room for questioning. After two hours of police questioning, a startled Miss Verdouw was allowed to start her vacation, albeit with half her spending money confiscated. “I'm just lucky that I had bank paperwork with me and that I didn't try to spend the money somewhere in Fiji,” she said. Editor's Note: There is still no official update from Fiji authorities, that includes the Fiji Reserve Bank and the police, about the missing money which at one stage was reported by the Fiji Sun as actually being $200 million dollars. Interpol was supposed to have been brought in to investigate the supposed heist but, again, nothing has been said about that either. Sa baci da lasutaki, iiiyeee sa qai druka. How on earth this lady could have withdrawn these 20 dollar bills in Fijian currency from an Australian Bank...wow Fiji bolice sa rauta mada na lasu. Any why is it that the Australia Police are not saying anything.....its because all what the Fiji bolice are saying is lies. 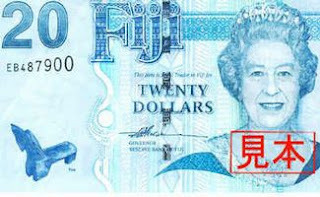 The lady has gone to the bank and exchanged Australian Dollars for Fijian Dollars prior to her ill-advised visit to Fiji. The bank in Toowoomba would have purchased the Fijian Dollars from The Reserve Bank. Methinks that the reserve bank of fiji is illegally exporting the notes that they had stolen in an effort to delay devaluation of the worthless Fiji dollar. Do you guys ever read what you write? No wonder there are very confused people out there who just do not understand what's going on. One can go crazy reading your comments. @ ex Fiji Tourist......hahaha a good analysis my friend, so the spot light is still around Suva, boy oh boy what a story this will make when we find out the real culprits. Both police ans reserve bank have publicly stated the true value of the missing shipment was '$200m in freshly printed $20 notes'. How the hell they made their way into an AUS bank before they were reported stolen is simply a mystery awaiting a solution - AFP already on case & unlike Fiji - AUS has a free & open press. Will have far reaching implications for regime? Oh boy this so exciting, will wait for the AFP and the free aussie press to tell us what and how it actually went down and all those involved. So, it could've been $1 million or $200 million stolen? !